The start of the PPE had been in the morning, when the vet also looked at my other two horses, who are recovering from tendon injuries. 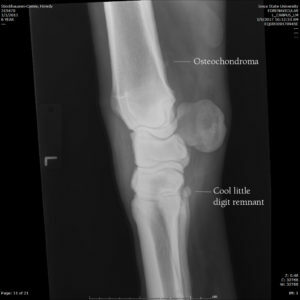 Back to Howdy: My vet reviewed the radiographs we took of knees, hooves and hocks and there was quite a lot to talk about it. Some of it was very good news: clean hock and knee joints, no sign of navicular – a good start. The new words I learned were crena and osteochondroma. The first one is just kinda cool and the second one could matter. This is a shot of looking straight down on a hoof. Howdy has a large crena, the notch in the bone in his hoof. Not indicative of anything, just kinda cool. Above is where things get a little dicey. That very tiny shadow is a cartilage covered bony protrusion. It could interfere with the deep digital flexor tendon of the distal radius. The little circle thingy that is labeled is literally a remnant of a digit. Horses are really walking on their middle “fingers”. The other digits are fading away, but Howdy is apparently getting in touch with his eohippus side. Taking “old school” to the next level. After seeing the rads, there was a long wait for the ophthalmologists to see Howdy about his eye. 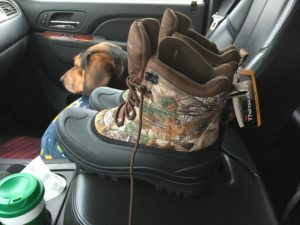 They told me in the morning it would be around 5 p.m. by the time they could see me, so I left the horses at the vet school, went out to lunch, took my dog for a short, cold walk, did my year end books on my computer and bought me some new barn boots on sale at a store nearby. Woot. Duggy got cold in the truck, so she rocked the babushka! 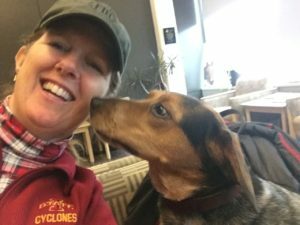 And then she got to come in to the waiting room and hang out with me and pilfer cookies from Becky the ISU Vet School receptionist/scheduler/miracle worker. End of day finally came and so did the ophthalmologists. 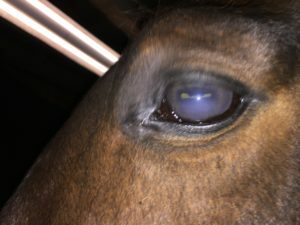 They dilated both eyes and peered in, and bottom line is, yup, horse has an eye infection, a good deal of pain and a miotic (constricted) pupil. Started topical antibiotic and atropine and banamine. Even if I don’t buy the horse, I’m not letting an eye infection get out of control on my watch if I can help it. Howdy behaved well all day, and it was a long one. Jay helped me settle the horses into the barn and we had a little supper and went to bed. I sent up a prayer that Howdy’s eye would heal and went to sleep.